BRANDON, MB – A handful of Brandon University (BU) students has been awarded federal funding for exciting research projects in biology, physics, and chemistry. The Undergraduate Student Research Awards (USRA) are given annually to high achievers by the Natural Sciences and Engineering Research Council of Canada (NSERC), to encourage graduate studies and research careers in the sciences. Seven BU students are sharing $31,500 in USRAs, plus almost $8,000 in awards from Brandon University. Students work on research projects over sixteen consecutive weeks this summer, under the direct supervision of a faculty member who holds an NSERC Research Grant. 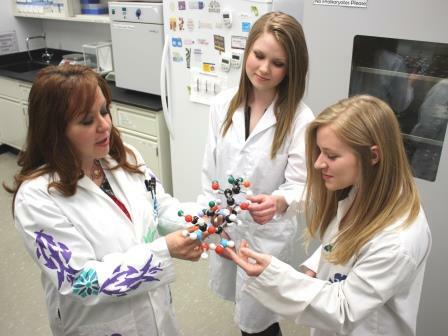 Katrina Cristall and Danielle Sharanowski are third-year science students researching drug resistance with Dr. Bernadette Ardelli, Department of Biology. “This laboratory experience is definitely going to help me decide whether I pursue a master’s degree or move right into the workforce”, says Sharanowski.